Are You Bugged by the Tobacco Beetle? One of many cigars ruined by a bug hole. When I first started collecting cigars, I had no idea how many sticks would be ruined by the dreaded tobacco beetle. 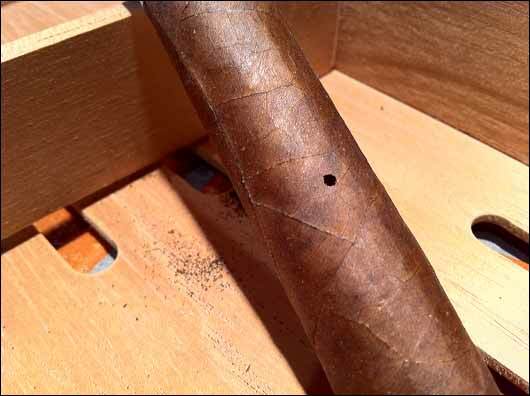 I’ve had to throw out countless cigars with “bug holes”. My question is, have you been plagued by this scourge? Please share your problems and solutions by commenting on this posting. These tiny critters drill down deep into our cigar collections. freeze all of your cigars for a week 7 days this kills the eggs and the beetle and get a brand new box the old you can clean and leave out in the sun outside for a day to kill moisture reprime and use for your less expensive cigars. I have been collecting/smoking cigars for over 30 years and never once had a beetle problem. Am I just lucky? I’m curious to hear how you store your cigars. If you don’t have bugs then you are certainly doing something right. But what is that? At what temp do you store your cigars? Are they ALL in cello? All in boxes? Please describe your storage setup. It could be helpful in keeping my bugs at bay. I have nearly 300 cigars. I use a combination of humidors (3), tupperdors (3), and cedar lined ammodors (2). None of those storage methods have given me any beetle problems. I use oasis foam humidifiers with 50/50 mix. I add distilled water periodically when they seem dry. i don’t go crazy with trying to get the perfect temperature and humidity. I tried that, but never found a thermometer or hygrometer that I liked. I can tell when my cigars are right by looking at them and feeling them. I check them often. Most are in cello, but I like to keep a small number without. The cigars in the tupperdors are in boxes. The rest are not. I have never put them in the freezer. I think my bug problem started last year. I’m not sure which cigar/cigars introduced them to my cigar collection. But, from the start, I was a bug problem waiting to happen. I have a closet dedicated to cigars, with over 1,000 single cigars in open trays, another 1,000 or so in boxes. (See the article here). I keep cigars from every corner of the cigar-making world, many of which are samples. Most of the cigars don’t have cello and are not isolated in boxes. So just one buggy stick could have contaminated the entire lot. Hopefully, freezing them will kill the culprits. But while inspecting each stick individually, I came upon two dead beetles, and two cigars with living larvae inside. It was gross. My fingers are crossed. Bug Update: After freezing all my loose sticks at sub zero temps for a week, I placed them back in my closet. After smoking a few sticks, I’ve found that freezing them had no ill effect at all. They all taste terrific. I’m keeping them in plastic bags for a while to make sure I killed all the bugs/eggs. But careful inspection of my many boxes has shown a few dead bugs stuck between the lid and bottom. I guess they were trying to get to the cigars inside, but couldn’t make it past the cedar lining. I sure hope I have eradicated all the pesky critters. Only time will tell. Thanks goodness that has not happened to me. Never had a problem. I store most of sticks in their boxes inside my humidor. Maybe that helps? I also prefer a slightly lower humidity. Typically between 68-70%. Maybe it’s been dumb luck. I think this problem is a function of temperature. Most cigar vendors keep their inventory at 65 degrees and I’m figuring it’s to keep the bugs at bay. When the temps rise at home, the bugs come out. And it doesn’t even have to bee that warm…anything above 72 degrees seems to encourage the critters. I’m planning on freezing my inventory of loose sticks, but I’ve got more cigars that I do room in my freezer. Argh! I hate this! I’m a relative newbie, but had my first encounter with the beetle tonight when a CB shipment arrived and five out of twenty 5 Vegas Atomics showed signs of the little buggers. Those five are in the freezer and the other 15 are in quarantine. Thank you for having such a cool site, I hope your control efforts were successful. Ken, sorry to hear about your bug problem. I’m surpised and alarmed that you got infested sticks from a vendor. That could mean the vendor’s warehouse is contaminated. If so, they are spreading the problem to all their customers. Did you contact them about this? Is CB Cigarbid.com? My contamination is over. After freezing all my loose sticks at -5 degrees for four days, I have been bug free. I’m keeping those sticks in plastic bags just in case. Yes, it was Cigarbid. I contacted them this morning and received an apology and an offer to replace the sticks if I returned them. They haven’t replied with details yet, but I presume they will pay for shipping. The infested sticks were spread across three 5-packs, though to be honest, I would say that only two cigars definitely have beetles (they have trails in the wrapper and deep holes). The other three have small holes and indentations in the wrapper, but it could just be from rough handling. I didn’t cut any of them open, but of course I closely examined all of them at that point (and the 15 “good ones” are in quarantine). The whole shipment (of those particular cigars) was a little haggard, I also saw some small cracking at the foot on a few. The beetle holes, etc. were all under the cedar wrapping though, so wouldn’t that have taken place at the factory? It’s definitely making me rethink ordering from Cigarbid, but maybe it’s 5 Vegas that I should be blaming. If it’s not too far off-topic, who’s your go-to vendor? I’ve had good experiences with JRcigars.com. When cigars are stored in temps above 75 degrees, bugs can hatch. It’s impossible to predict what brands will be safe. Manufacturers fumigate all the tobacco they use for their cigars, but eggs somehow manage to survive. I’m dreading the summer. In Los Angeles, we can get heat spells that last weeks. 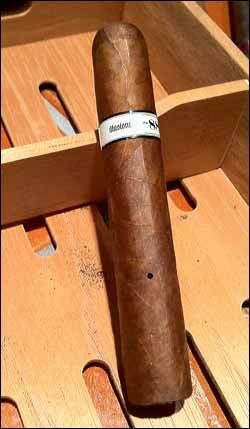 Since my bug issues, I’ve decided not to keep any sticks open in my cigar closet. Everything is either in boxes or plastic bags. If bugs hatch, at least they will be contained. I’m hoping that freezing has killed ALL the eggs, and that no new infestation will occur. I’ve used cigarbid.com loads of times. 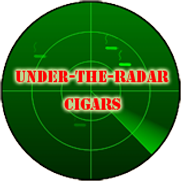 They are the best source for cigar bargains. I’ve been happy with everything they’ve delivered. As far as recommending a good vender, that’s all about what type of cigars you smoke. I look for unique smoking experiences and tend to explore boutique brands. 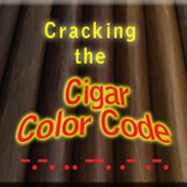 For my tastes, Atlanticcigar.com is terrific. I belong to their VIP program and get additional discounts on boxes. Thanks for the info. It is certainly hot in SoCal today. Will your cigars age “properly” in plastic bags? The temp in my cigar closet is 75 degrees…ouch! This will be test to see if freezing my cigars truly eradicated the bugs. So far, the cigars in the plastic bags are doing very well. They taste great, no mold, and smell perfectly conditioned. I don’t think plastic bags will keep the cigars from aging. I also open them up periodically to breath. Just got home from being away for four days. When I lifted the humidifier from the floor of my cigar closet, I noticed some spider webs. Entangled in the webs were a few dozen dead tobacco beetles. I guess my infestation was worse than I realized. But I’m glad the spiders caught so many bugs. But no sign of live beetles, right? You just made me envision a whole “old lady who swallowed a fly” scenario where the spiders start to eat tobacco, and you end up opening the door one day and there’s a horse chewing on your cigars. I’m sure glad tobacco beetles are small. They do enough damage being the size of a pin-head. If you find a hole in one cigar out of 1000 is it still worth freezing them all? I would freeze them all. If one cigar hatches a bug, I would assume all the cigars in that box weren’t properly fumigated or frozen at the factory. The next time the temperature rises, that box could end up looking like a science project. Hey Joe I was looking online and ran across this thread. I’m just curious how your beetle infestation has turned out? I got nailed with an infestation a couple days ago and am in the process of freezing my stash at -3 f. What has happened since your last post on this? Also I have a large portion of my collection in boxes. Do you think those are safe? And do u think I should toss the humidifiers that were in my humi. I wiped the inside with an ammonia distilled water mixture. Sorry to hear you have been bugged Smokeejohn. I have been bug free since my infestation years ago. Here’s what I did…I threw out all my effected sticks, wiped the “buggy” boxes clean, froze the remaining cigars from those boxes in tupperware for three days at 0º, and put them back in their original boxes. I haven’t frozen any cigars since then, and I’ve been fine. BUT, I just came back from Cuba, and am freezing all the cigars I bought there. I don’t trust the Cuban government to be vigilant about such matters. I think any of your boxes that were not bugged should be okay. I would replace or try freezing your humidifiers just to be safe.